Most mortgage bankers follow the business model of generating small returns on large number of loan transactions. The amount of income – fee income and other non-interest income – generated in mortgage banking is primarily controlled by the marketplace and competition. A profitable mortgage banking business, then depends on controlling expenses of the operations. Individual components of the mortgage banking operations must be effectively monitored and managed. Such scenario makes the role of an effective Encompass360 Administrator much more demanding. The costs in production of mortgage loans can be fixed costs and variable costs. It’s essential for the viability of a mortgage originating operation to have fixed cost personnel to be retained. These fixed cost personnel include a set of high-quality underwriters, closers, QAs, compliance personnel and back-office. Apart from these fixed costs, there come the variable costs associated with origination staff or servicing operation. As the loan volume decline, the fixed costs remain the same and cost per loan increases. Increase in cost per loan can lead to lower profitability and in some case, operating losses. These production costs can lead to pressure which causes lowered underwriting standards to maintain volume. And, lowered underwriting standards leading to defaults and penalties. Since these professionals are required based on a volume of the loans originated at an organization, they may not be required on a full-time basis. 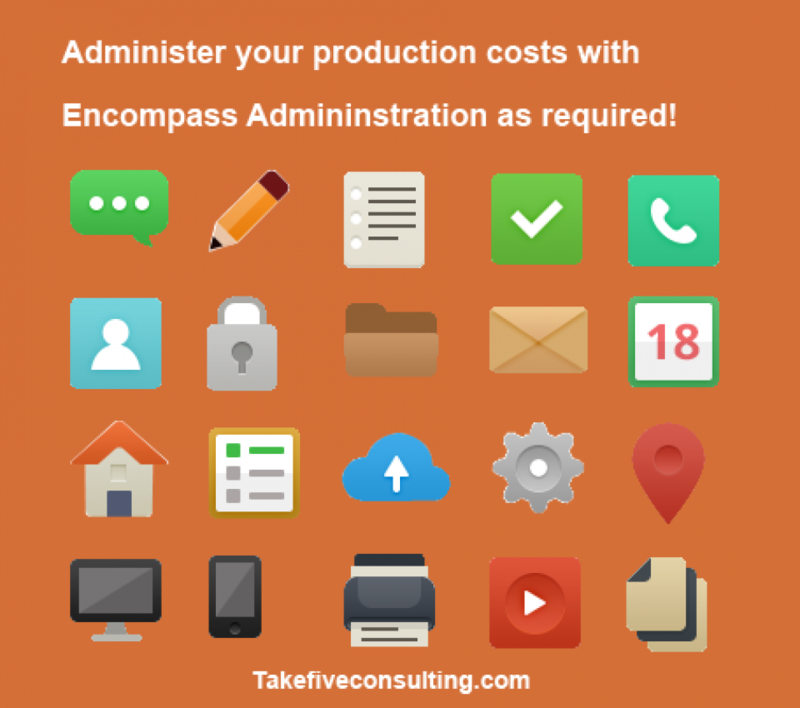 With our client’s demand for Encompass360 Administrators on a part time or contract basis, TakeFive Consulting started offering Encompass Admin services as a customizable package. Here’s a detailed look at Encompass360, a prominent support system and its administration on contract offered by TakeFive Consulting. TakeFive’s Encompass360 administration on contract program is designed to create a work environment for your Encompass360 users to maximize their efficiency, improve quality and reduce cost and time input in originating mortgages. Company Information feature is used to enter company information and licensing data for the mortgage origination company and its branches. License and license type of the company, this information is used when running a compliance test on a loan file. When a company does business in Maryland or Kansas, the appropriate option for Statutory Election in Maryland or Kansas can be selected for first lien, subordinate lien, junior, closed-end, and open-end loans for subject properties. Create Network company password to protect any unauthorized access to Loan mailbox and any electronic service providers. When its changed, its shared with all users. Set up usernames and passwords for new individual encompass360 users. Single Sign on access to users can be provided. Job functions and access to functions, forms and tools in Encompass. One or more personas are assigned to users. Some of the Personas are compliance, Auditor, Loan officer, Loan Validators – Underwriters, Do Drawers, Funder, Quality Control, Servicer, Lock Desk, Accounting. Organization hierarchy is used to establish the relationship between users. These are depicted as a series of related folders representing organizations, departments, branch offices, job functions etc. The hierarchy’s main function is to determine which users will have default access to other users loan files. Roles carry out loan tasks in the workflow. A role can have multiple personas and user groups. Milestones are steps in the workflow that contain loan tasks that are carried out by an assigned loan team member. A set of milestones and roles are as follows; Started, Qualified (Loan officer), Processing (LO/LO Assistant), Submittal (Loan processor), Credit approval (UW/Validator), Resubmit (Loan processor) Approval (UW/Validator), Submit to close (Loan Processor), Doc Signing (Doc Drawer), Funding (Funder), Ship to Investor (Shipper), Purchased (Accounting), Completion (Shipper). Usergroups are created to grant access to a set of people who must perform or access a particular template or forms, for example a state uses a specific set of forms. Use the Company Details setting to create and manage lenders, brokers, and third party originators (TPO) with whom your company does business. Use the TPO Settings option to create custom values for drop-down menus in the Company Details and Contact Details settings such as company and contact status, company rating, attachment category, and price groups. Some values are available out of the box. You can edit or delete these values, if required. Use the TPO Reassignment tool to view TPO companies and contacts assigned to a TPO sales rep and reassign the company/contact to another sales rep. For example, if a TPO sales rep is no longer with your company, use this feature to reassign the TPO organizations and contacts the TPO sales rep was managing to a different TPO sales rep.
Use the TPO Custom Fields setting to create up to 100 custom fields for your TPO companies and contacts. There are a variety of field types, two of which are drop-down lists of predefined selections that you create. TPO custom fields configured within this setting are displayed in the Custom Fields tab on the Company Details window. Use the All TPO Contact Information setting to view the list of all TPO contacts within the system and edit the information if required. You can sort, filter, and export the list, locate the contact in the company hierarchy, and email the contact. Use the TPO Fees setting to configure how fees are calculated in TPO loans. Roles carry out loan tasks in the workflow. In Encompass, the loan processing workflow is divided into stages called milestones. This tool is used to create and edit business rules that determine how loans are originated and moved into loan folders – The rule defines importing, originating, and duplicating of loans. This tool is used to define and manage requirements that must be met before a milestone is finished. Eg: One can create a rule that requires a credit report has been received before the file started milestone can be marked as Finished. These rules are used to control the values entered into the fields on input forms. Admin can specify a condition for applying the rule, required values for the field and pre-required fields that must be completed first. Also create create rules that must be completed before a form button is activated. Eg: Specify the fields required prior to requesting a lock. Define the input forms made available when a specified condition is met. Eg: In case of an FHA loan, only forms required for processing and FHA Loan would be made available. Use the Persona Access to Fields tool to manage access to fields and buttons on input forms by persona. You can specify a condition for applying the rule and different access for each persona and condition. Use the Persona Access to Loans screen to manage access to loan files by persona. You can specify a condition for applying the rule and different access for each persona and condition. Access can be View Only, Edit, or Custom. The Custom option allows you to grant access to areas of the loan file (such as the Lock Request tool) as well as specific fields on loan forms. Control access to documents in the efolder. Using Role access, admin can protect access for a role, revoke access and manage deletion settings. The Input Form List is used to define the input forms made available for a loan when a specified condition is met. Use the Loan Form Printing tool to create rules that restrict the printing of forms until required fields are completed or other custom rules are satisfied. When specified fields must be completed prior to printing, users receive a message listing the required fields that must be completed. Determine the default set of forms that are automatically selected in the print window for loans that have specified values in selected fields. Encompass administrators can use the Appraisal Order Management setting to configure the appraisal ordering process for different types of loans. The setting allows administrators to select a loan type and then select the configuration options used for that loan type. originators such as brokers) or the compensation being paid to your company by a wholesale lender if your company is acting as the broker. The Default Input Forms tool is used to specify the default list of input forms, and the order in which those forms are display on the Forms tab. The Condition Forms tool is used to create customized templates for the condition forms. Conditions forms currently setup in Encompass allow users to record and view conditions that must be met in order to complete a loan application. The Custom Print Forms tool can be used to create custom forms, letters, and other documents to send to borrowers, prospects, and business partners. Once custom forms, letters and documents are created, the documents can be printed, mailed or sent electronically. Use the Print Form Groups tool to create groups of forms that you regularly print or send together. When forms are sent or printed using the Secure Forms Transfer tool, time is saved by selecting a form group instead of searching for, and selecting, each individual form. Once a print form group is created, you can duplicate, rename, modify, cut, copy, delete or move the print form group. The Loan Custom Fields tool is used to create custom loan fields that meet specific requirements of the mortgage operations business. The Auto MERS MIN Numbering window is used to setup a MERS MIN Numbering system in Encompass. The seven digit Organization ID provided by MERS is entered in the corresponding field. Loan folders are used to organize loans into groups. Loan folders can be created to group loans by categories such as loan type, loan status, or month of origination. An alert is a notification indicating an event has occurred, is pending, or is due. Alert details are displayed on the Pipeline and in the loan file. Auto loan numbering is used to assign loan number automatically irrespective of the branch originating the loan. The Channel Options tool is used to indicate the options available on the Channel list on the Borrower Summary form and to configure how NMLS reports will handle certain types of loans. The Lock Expiration Date window defines the starting point for calculating the rate lock expiration date. By default, the starting point is the date the rate is locked. RESPA covers loans secured with a mortgage placed on a one-to-four family residential property. These include most purchase loans, assumptions, refinances, property improvement loans, and equity lines of credit. Use the Changed Circumstances Setup tool to manage the list of changed circumstances users can select from when indicating a change in circumstances on the Loan Estimate Page 1, Closing Disclosure Page 1, and 2010 GFE input form. Use this feature to select the GFE output forms to print by default. When you initiate printing of the GFE, the default forms are placed on the list of Selected Forms to print. Use the Trustee List to create trustees with whom your company does business. Users can then select a trustee from this list when completing the Closing Vendor Information form. Define the forms to track, how the history entries are added and decide whether the day disclosure is sent needs to be added when calculating compliance timeline. Create and manage the tracking information associated with loan documents and services, including standard forms, custom forms, settlement services, verification, and documents that are supplied by the borrower. There can be different loan programs at a company; Conforming Loan Programs, Government Loan Programs (FHA, VA, RD), State Loan Programs etc. By default, when a template is applied to a loan file, all template fields (including blank fields) overwrite the associated fields in the loan. The user also has the option of selecting a check box so that only fields from the template that contain a value are applied. Create sets of forms that displays on the forms list in the loan workspace. Input Form Sets are available to use as a component of a loan template, or can be applied individually from within a loan. Create predefined lists (templates) of settlement service providers. When a template is created, the list of service provides associated with the template are displayed in the Settlement Service Provider List form. These templates are available to use as a component of a loan template or can be applied individually from within a loan. Use the Affiliate Business Arrangement Templates setting to Create an Affiliate Template. Create a set of documents that meets the requirements of various loan scenarios or particular lenders. Document Sets are available to use as a component of a loan template or can be applied individually from within a loan. Group predefined tasks into task sets that are associated with particular milestones. Task sets can then be added to loan templates. Task Sets are available to use as a component of a loan template or can be applied individually from within a loan. When the template is used to create a loan, the tasks in the task set are displayed on the appropriate milestone worksheet. Create templates of default loan data. Data templates are available to use as a component of a loan template set or can be applied individually from within a loan. Can be comprised of one to seven loan template components; Milestone templates, Document Sets, Input Form Sets, Data Templates, Loan Programs, Closing Costs, and Task Sets. Use the Escrow tool to create tables of escrow fees for purchase and refinance loans. Each table contains parameters for calculating the fees charged by the company. After tables are created, you can select them from input forms such as the 2010 Itemization and California MLDS. The fee is calculated and placed on the form. Use the Title tool to create tables of title fees for purchase and refinance loans. Each table contains parameters for calculating the fees charged by the company. After tables are created, you can select them from input forms such as the Good Faith Estimate and California MLDS. The fee is calculated and placed on the form. Use the HELOC Table tool to create the example data that is used on the HELOC custom form, “Important Terms of Our Home Equity Line of Credit.” The data in the example tables shows how the annual percentage rate and minimum monthly payments for a HELOC loan with an outstanding balance of $10,000 would change based on changes to the index. Use the MI Tables setting to determine the kinds of mortgage insurance data you can automatically populate into fields on the MIP/PMI/Guarantee Fee Calculation tool. Mortgage insurance (MI) tables enable you to set up company-wide conditions that define specific types of loans and to associate different mortgage insurance data with each type of loan. FHA county limits are the maximum amounts allowed for FHA loans based on the county in which the property is located. The County Limits table is used to automatically populate the county limit amount for an FHA loan on the FHA Management form and to warn the user if the loan exceeds the limit. Use the City Tax tool to create formulas that calculate city recording and transfer fees. After formulas are created, you can select them from the Good Faith Estimate or 1003 application. The required field is calculated and placed on the form. Use the State Tax tool to create formulas that calculate state recording and transfer fees. After formulas are created, you can select them from the Good Faith Estimate or 1003 application. The required fee is calculated and placed on the form. Use the User Defined Fee tool to create formulas that calculate user defined recording and transfer fees. Once formulas are created, you can select them from the Good Faith Estimate or 1003 application. The required fee is calculated and placed on the form. The LO Compensation setting enables administrators to configure loan originator compensation plans that specify the criteria that will be applied when calculating compensation paid to loan originators. Here the administrator can create or edit any number of plans for loan officers, third party originators (brokers), lenders, specific companies or branches, and activate or deactivate a plan. Use the Analysis Tools to search for Encompass input fields and locate the areas in Encompass Settings where the fields are used, including business rules and alerts. Use the Rebuild Pipeline tool to synchronize the contents of folders with the folders on the server. You must also rebuild the Pipeline if folders were added, deleted, or changed from outside of Encompass. Use the Current Logins tool to view and manage users who are logged in. Use the All User Information tool to view users, find a user in the organization hierarchy, and send emails to selected users. This tool is only available when you are logged in as an admin user. Use the Loan Reassignment tool to assign a different user to one or more loans. You may need to reassign users if they leave your company or change roles. Use the Unlock Loan File feature to unlock a read-only file. A file may also become locked if the connection to the server is lost while the loan file is open. Use the System Audit Trail tool to search for entries in the system audit trail based on selected criteria. After completing a search, you can export one or more entries to a Microsoft Excel spreadsheet. Use the E-Document Management license tool to grant access to users who will be using Electronic Document Management (EDM). Administrators can use the Company Status Online setting to set up a company’s default templates and triggers for the Status Online tool, and to authorize Encompass users to use the Status Online feature, including the Status Online Tool and the Personal Status Online setting. One of the provisions of the RESPA regulations that went into effect in January 2010 states that once a mortgage broker (or mortgage provider) receives an application or information sufficient to complete the application, the lender who agrees to go forward on the application (or the mortgage broker) must provide the initial disclosures, including the GFE, to the borrower within three business days. The lender is responsible for determining whether or not the GFE has been provided. Users with Encompass admin user IDs can use the Compliance Review Setup to configure the Encompass Compliance Service. The Encompass Compliance Service provides an instant loan file check and determines if a loan complies with selected state and federal regulations. Use the 4506T Service setting to start or stop the 4506-T service in Encompass, and select the Encompass users who can access the service. After you start the service, the selected users can click the Order 4506-T button on the Request for Transcript of Tax form to order 4506-T products electronically, check the status of orders, and retrieve electronic documents when an order is complete. Use the e360Select Setup tool to grant users access to the e360Select program. e360Select presents loan-related programs and offers to Encompass users based on specific loan data. As a loan team member views or edits a loan file, e360Select may present one or more offers to the right of the current input form. These offers will only display if the loan contains the required loan data or values. Authorized Encompass users can use the Appraisal Service to send appraisal orders directly to appraisers from Encompass. Using the Appraisal Service tool in Encompass Settings, you can set up a merchant account and enable users to charge the borrower’s credit card for appraisal ordering fees before sending the order to the appraiser. Use the Title Service tool to set up credit card accounts to be used to pay the transaction fee that title/closing companies are required to pay before they can accept an order they receive from Encompass. Once an account is created, authorized users will have the option to pay this transaction fee on behalf of the title/closing company before submitting an order to them. To sign up for the Fraud service, contact your Ellie Mae account representative. They will walk you through the process of signing up for the service. Use the Flood Service setting to start the Flood Service for your Encompass system and grant access rights to specific users. Connect with DataTrac – process loans from POS to LOS without having to rekey data or import/export loan data files. The Documents tool is used to create and manage the tracking information associated with loan documents and services, including standard forms, custom forms, settlement services, verification, and documents that are supplied by the borrower. The Document Groups tool is used to create groups of related documents that simplify the management of documents in the eFolder. Used to define the order in which to display documents in the Send Documents window in the eFolder. Select the eDisclosure packages that will be sent to borrowers and to enable or disable the eSigning option for loans. Create templates of preliminary and underwriting conditions that can be added to a condition set and import into the eFolder for a specific loan. Create sets of preliminary and underwriting conditions to meet the requirements of different loan criterion, such as by loan type. Create templates of post-closing conditions that you can add to a post-closing condition set and import into the eFolder for a specific loan. The eFolder’s Post-Closing Condition tab is typically used by shipper or post-closer to track and manage trailing documents and any other outstanding conditions. Create sets of post-closing conditions that must be met after a loan has closed. Conditions from a Post-Closing Condition Set can then be imported into the eFolder’s Post-Closing Condition tab for a specific loan. Create a predefined list of custom statuses for your borrower contacts. The Status field (and list of custom statuses) displays on the Extra tab of the Borrower Contact screen. Use the Borrower Contact Update screen to change the milestone to update the information earlier. Take Five Consulting draws from years of experience in mortgage banking to offer effective Encompass Administration tasks quickly to streamline the process from the very beginning.